A Manassite who in one passage is called the son of Hepher, the son of Gilead, the grandson of Manasseh (Num. xxvi. 29-33), and in another is set down as the second son of Manasseh (I Chron. vii. 15). The etymology of the name is very doubtful; some scholars think that the root is Syriac and means "first rupture," indicating that he was a first-born son (comp. 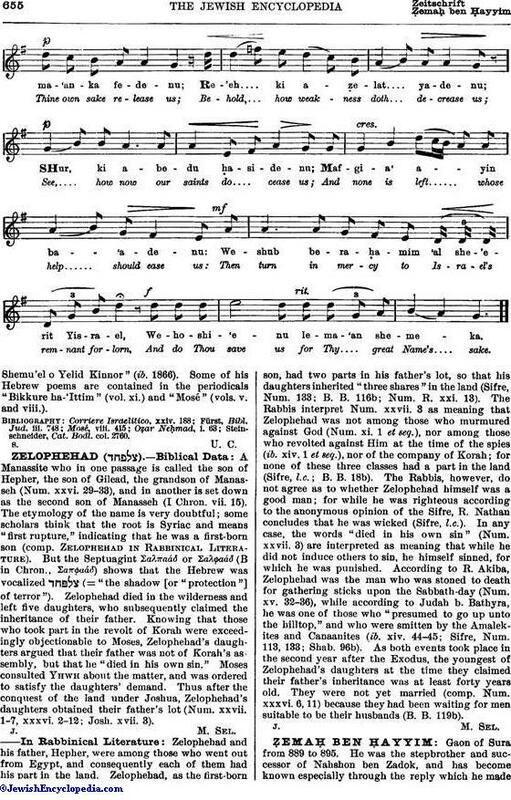 Zelophehad in Rabbinical Literature). But the Septuagint Σαλπαάδ or Σαλφαάδ (B in Chron., Σαπφαάδ) shows that the Hebrew was vocalized (="the shadow [or "protection"] of terror"). Zelophehad died in the wilderness and left five daughters, who subsequently claimed the inheritance of their father. Knowing that those who took part in the revolt of Korah were exceedingly objectionable to Moses, Zelophehad's daughters argued that their father was not of Korah's assembly, but that he "died in his own sin." Moses consulted Yhwh about the matter, and was ordered to satisfy the daughters' demand. Thus after the conquest of the land under Joshua, Zelophehad's daughters obtained their father's lot (Num. xxvii. 1-7, xxxvi. 2-12; Josh. xvii. 3). Zelophehad and his father, Hepher, were among those who went out from Egypt, and consequently each of them had his part in the land. Zelophehad, as the first-born son, had two parts in his father's lot, so that his daughters inherited "three shares" in the land (Sifre, Num. 133; B. B. 116b; Num. R. xxi. 13). The Rabbis interpret Num. xxvii. 3 as meaning that Zelophehad was not among those who murmured against God (Num. xi. 1 et seq. ), nor among those who revolted against Him at the time of the spies (ib. xiv. 1 et seq. ), nor of the company of Korah; for none of these three classes had a part in the land (Sifre, l.c. ; B. B. 18b). The Rabbis, however, do not agree as to whether Zelophehad himself was a good man; for while he was righteous according to the anonymous opinion of the Sifre, R. Nathan concludes that he was wicked (Sifre, l.c.). In any case, the words "died in his own sin" (Num. xxvii. 3) are interpreted as meaning that while he did not induce others to sin, he himself sinned, for which he was punished. According to R. Akiba, Zelophehad was the man who was stoned to death for gathering sticks upon the Sabbath-day (Num. xv. 32-36), while according to Judah b. Bathyra, he was one of those who "presumed to go up unto the hilltop," and who were smitten by the Amalekites and Canaanites (ib. xiv. 44-45; Sifre, Num. 113, 133; Shab. 96b). As both events took place in the second year after the Exodus, the youngest of Zelophehad's daughters at the time they claimed their father's inheritance was at least forty years old. They were not yet married (comp. Num. xxxvi. 6, 11) because they had been waiting for men suitable to be their husbands (B. B. 119b).